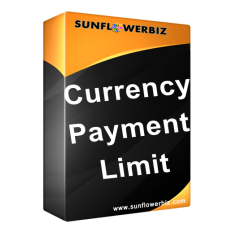 This SunflowerBiz Currency Payment Limit module allows you to select different payment methods for each currency. You can select payment method(s) from all existing payment methods for each currency in admin->system->localisation->currency. After you select currency by switching currency symbol in front, it will display corresponding payment methonds in checkout page. The module requires vqmod! PLEASE INSTALL VQMOD (http://vQmod.com) BEFORE INSTALL THIS MODULE! Note: this module may have conflicts with our other payment limit module like product payment limit, category payment limit, customer payment limit, etc. Please disable other payment limit modules when you test on our demo site. 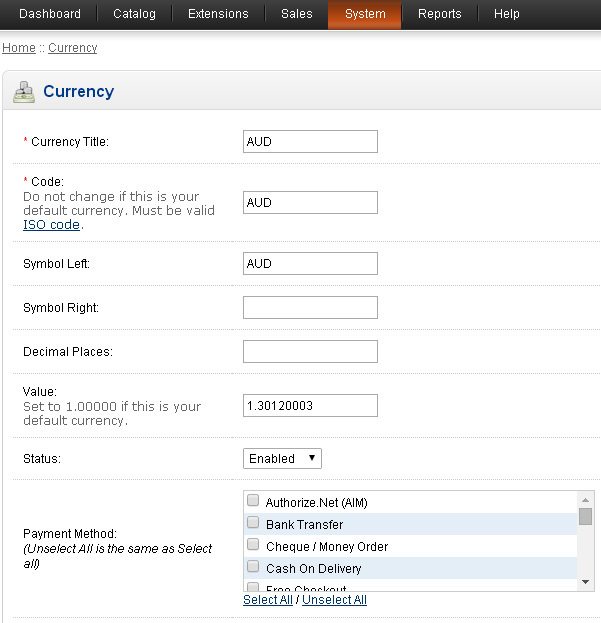 Select payment method(s) for each currency in admin->system->localisation->currency. Select from all installed payment methods. Select all is the same as unselect all. Note: If your table name has prefix, please change table name to [prefix]_currency.